Below are the steps you need to take to take cuttings from your tubers. 1. 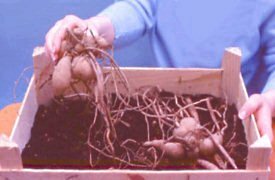 Place the tubers in boxes on a layer of moist peat. 2. 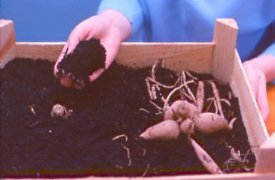 Cover tubers with more peat. 3. Leave the crowns exposed. 4. Remove the shoots taking care not to damage the tubers. 5. Trim off below a node and remove lower leaves. 6. Make a hole with a dibber and insert cuttings carefully in the compost. 7. Firm in the compost around the cutting. Follow these instructions and advice if you want to take the best cuttings from your tubers. In early spring dahlia tubers produce young shoots that can be used as cuttings to grow new plants. To obtain maximum growth from the new plants, the tubers should be encouraged into early growth ideally about mid February to March. 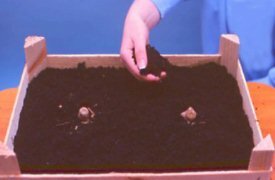 Cover the bottom of a box (a tomato tray is ideal) with moist peat, then place as many tubers as will comfortably fit on top. Cover the tubers almost completely with moist peat, leaving only their crowns exposed. Move the boxes to somewhere with a little warmth to start the tubers growing, such as a conservatory or warm greenhouse. With the moisture from the peat and an average temperature of around 10 degrees C, growth will start within two or three weeks. Eyes will appear on the crown of the tuber, and these eyes will produce the shoots that can be used for cuttings. Keep the peat moist while the tuber is growing, but be careful not to overdo it. The peat should not become soggy. Use a watering can with a very fine hose to give you good control over the amount of water you are supplying. When the shoots are between 75mm (3in.) and 125mm (4in.) tall, they are ready to use as cuttings. First fill some pots, 75mm (3in.) or 87mm (3½ in.) with a potting compost such as John Innes No. 1 or an equal mixture of peat and sand. Use a sharp knife to cut away the shoots a little above their base, where they join the crown. Take care not to cut the crown itself, which would prevent further shoots forming. Trim the stem of the cutting just below the joint of the lowest pair of leaves, then carefully remove the leaves too. Make sure you do not damage the joint itself when doing this. Sometimes these first cuttings have hollow stems and I have found them difficult to root. Discard them because more shoots will follow and they are sure to be more suitable for propagation. Dampen the end of the prepared cutting, then dip it in hormone rooting powder. Use a dibber or pencil to make a hole about 25mm (1in.) deep in the compost; insert the cutting, and firm it in with your fingers. Several cuttings can be put in the same pot, but it is best to stick to only one variety per pot. Ensure each pot is labelled to prevent confusion. Put a propagator top over the pots, or put them into a propagating frame. They need a warm position, out of direct sunlight. After two or three weeks, roots will have formed and when new leaves start to grow, the plants can be moved onto individual pots of John Innes No. 2 compost. Grow the plants on in these pots until the end of May, then move them to a sheltered position, such as a sunny patio. This will help to harden off the plants before they are planted out in the garden. 8. Cover with a propagating dome to maintain a moist atmosphere. 9. A lovely basket of Curiosity staged at Chipping flower show by Jimmy Heginbottom.